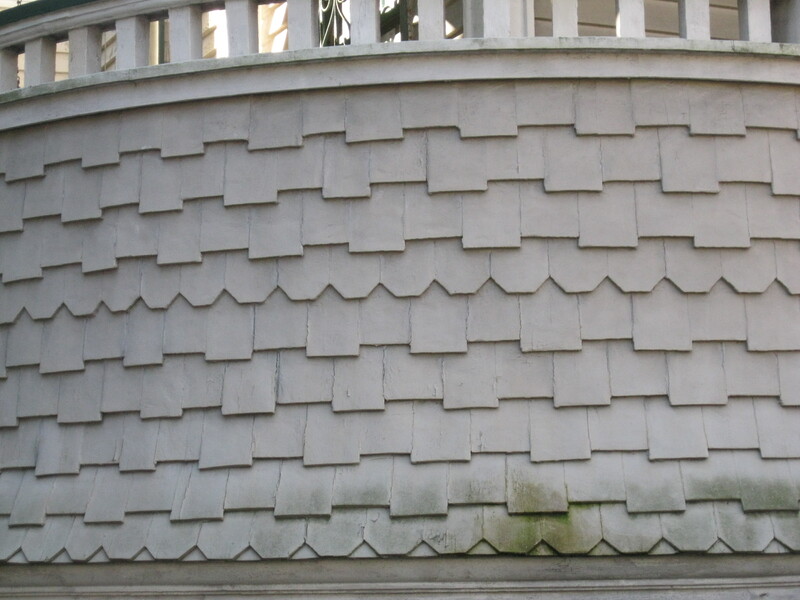 The improvements in circular and band saws by the late 19th century allowed for more intricate detail to be cut into wood, and many Victorian houses in Charleston are distinguished by their exterior elaboration. Although some Victorian architecture was borrowed from earlier Classical styles, it’s very easy to pick out certain signature details of the late 1800’s. 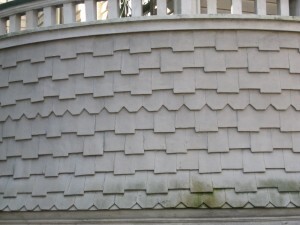 One of the most common is the look of “fish-scale butts”, pictured here, which is a siding cut into small, protruding sections that look like shingles on the exterior frame. Another Victorian giveaway is the double bracket under a cornice or a double column on a porch, as the late 19th century was known for buildings that were bulky and ornate. Rusticated stone exterior was another favorite of Victorian builders, who often mixed stone and brick, or stone and wood for effect. 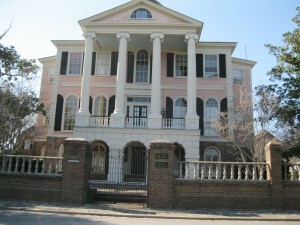 Of course, the most common victorian style in Charleston are the high-hipped Mansard, or Second Empire roofs, and the rounded Oriel windows. 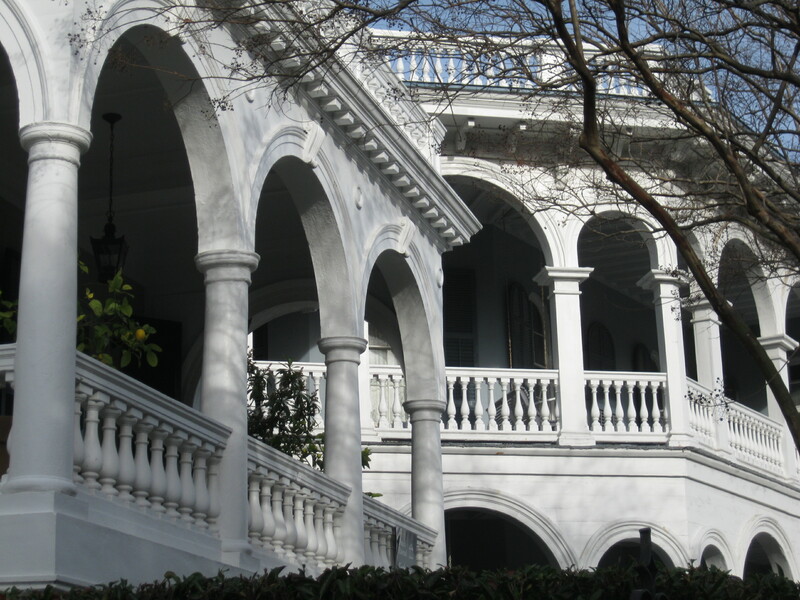 If you like Victorian architectural details, Charleston is packed with them, and many were added to buildings constructed in earlier times. Underground Charleston may seem like a misnomer for a city next to the ocean, but we do have some substantial subterranean sites. Such as this hydrant tunnel that was built beneath a cotton warehouse in the 1880’s to keep a ready supply of water in case of fire. The first hydrants in Charleston were actually wells dug in areas where they could be accessed by fire brigades, who would use hydraulic and steam pumps to spray on burning areas. 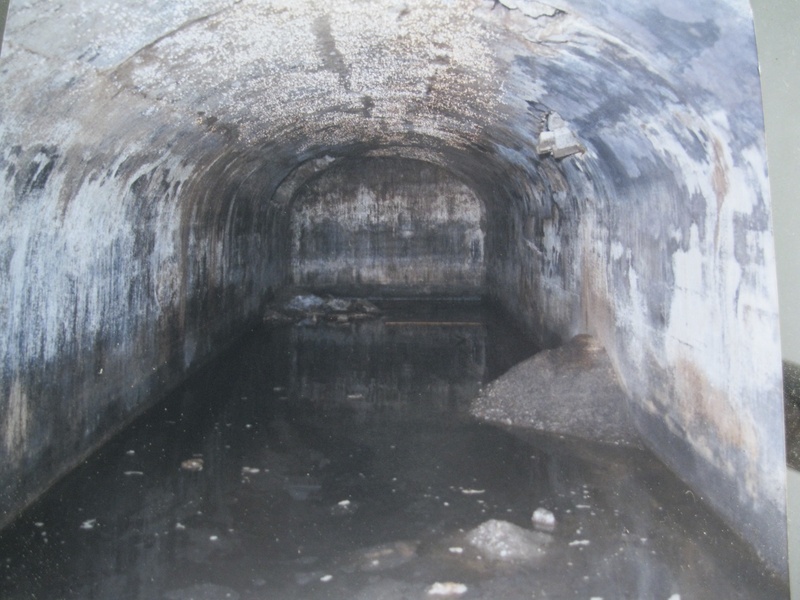 This tunnel was discovered just off East Bay Street between East Elliott and South Boyce’s Wharf streets about 15 years ago by developer Brownie Hamrick. He was replacing the old gas station there with the current condominium that is beautifully built to fit the historic street. The gas station was first built there in the 1920’s, replacing the old cotton warehouse that pre-dated the Civil War. 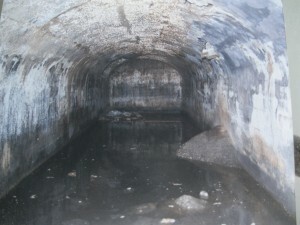 Brownie said that the block-length masonry tunnel was fully high enough to stand up a walk through, showing how much water capacity was needed on hand in the event a cotton warehouse and its valuable goods caught fire. Downtown Charleston is only three miles from the Atlantic Ocean, so it’s natural that sea-faring has always been a part of our past. Sadly, our maritime museum focuses only on World War II, when there has been so much naval history here since the 17th century. 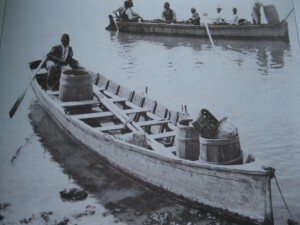 Many of Charleston’s citizens historically made their livelihood on ships, and such famous sea-farers as William Rhett, George Anson, James Misroon, Florence O’Sullivan, Francis Saltus would establish roots in a city where shipping is still the number one industry. 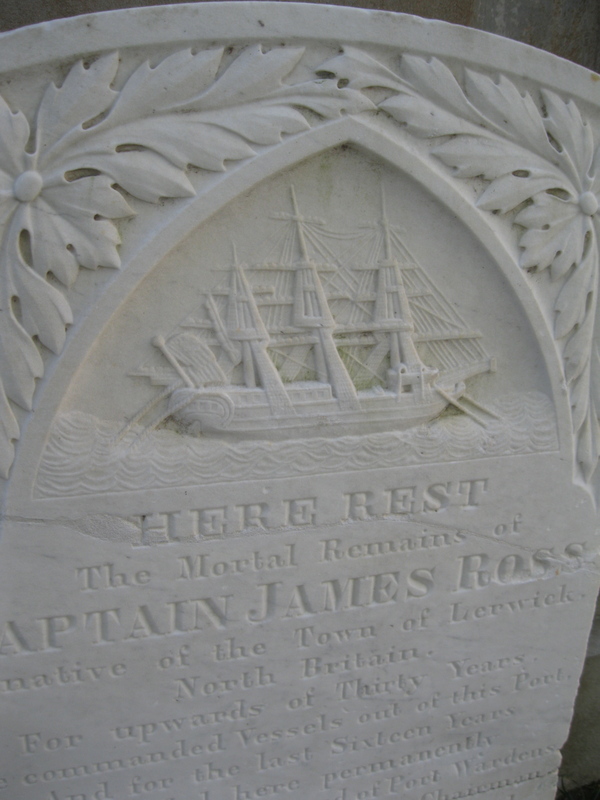 Symbols from the glory days of tall-masted ships still adorn grave markers throughout the historic city, but otherwise there is little minder that great sailing vessels were once built in local shipyards, and that daring commercial and military seafarers helped build this city by the sea. My good friend Gary Erwin is hosting the 23rd annual Lowcountry Blues Bash in February. It’s the best blues festival in the Southeast! A multi-day event (almost two weeks!) with more than 50 acts of traditional and contemporary blues performing at some 20+ locations (clubs, restaurants, public libraries, churches, etc.) throughout the city. Hear everything in blues music — electric, acoustic, solos, bands, legends and new talent. Many shows are free admission and open to all-ages. Fri Feb 8 SHELLY WATERS, SWAMP POP PRINCESS (duo) / Med Bistro, FREE New CD out in February! The new CD “Star Marina” out in February! Last shows before European tour! Last but not least, we fondly remember CHICAGO BOB NELSON (Robert Lee Nelson) 1944-2013, swamp harmonica legend and wonderful blues torchbearer, who passed away last week. Like many blues artists, Bob never got his due in this world, but leaves us with a rich legacy of great music, good times, and rewarding friendship. About 75 BC, a Roman scholar named Vitruvius published a book in Latin called De Architectura, or “On Architecture”, in which he spelled out the basic tenets of Classic architecture. Vitruvius wrote that buildings should be solid, useful, and attractive, and went into considerable detail as to the use of materials, methods, and concepts of buildings as a means of applying logic to construction. Vitruvius was particularly aware of the spatial order of buildings, and how the ratio of size, circumference and weight were all important to the aesthetic goal of construction. Thus, with adherence to Vitruvius’ ideals, Classic architecture remains a timeless pleasure. 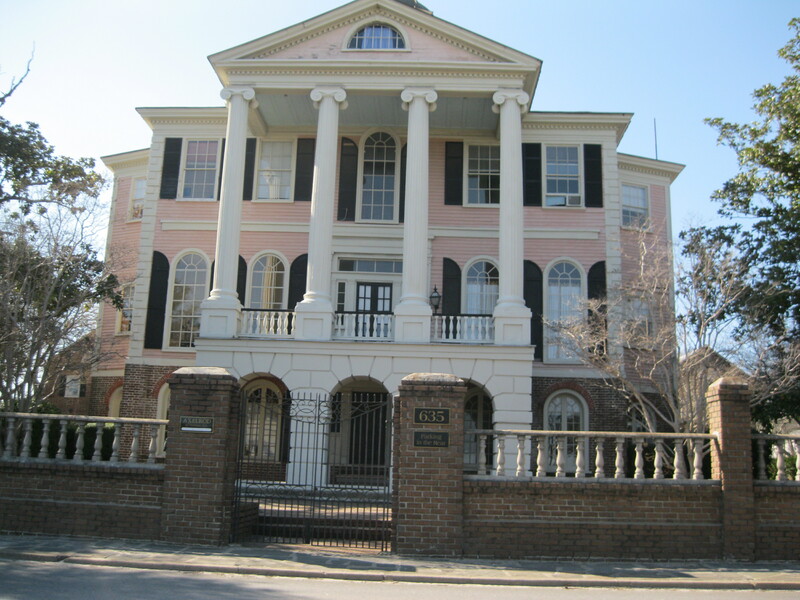 What is a perplexing question here in Charleston and throughout the world, is, why are modern architects, who have left comparatively so little work that is as pleasing as the classicists, so opposed to continuing and contributing to styles that have inspired so many for so long? It isn’t called “classical” for nothing. The peculiar-looking weapon at White Point Garden facing South Battery is not a version of the famous Gatling Gun, but a Spanish-made rapid fire gun taken as a trophy during the Spanish-American War. The gun is marked with the date 1886, and was fixed on a Spanish warship as armament. 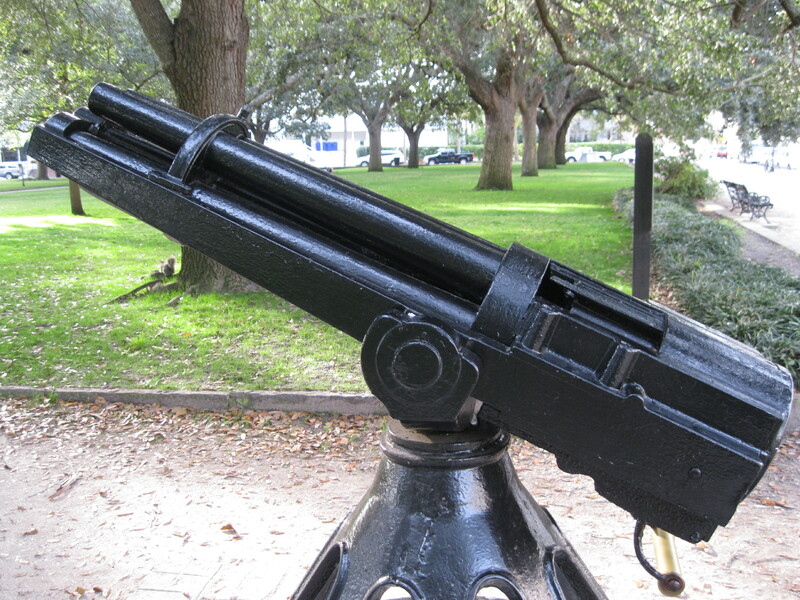 The ship was apparently captured or surrendered, and the gun was removed, but not donated to the City of Charleston until 1937, when it was placed at White Point Garden to complement the numerous military displays there. The five-barrel was fired by a rotating cylinder that loaded and fired new rounds continuously, which is the same concept as the Gatling Gun. 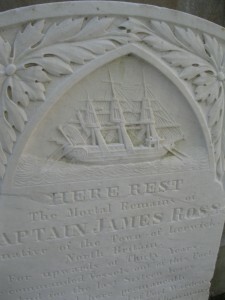 Considering the woeful record of the Spanish navy against the U.S., the gun probably caused few casualties, and like many of the weapons frequently climbed-on at White Point Garden, has surely contributed to more injuries in peace time than in war. 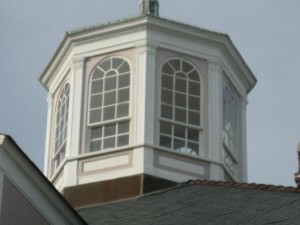 The cupola is a distinctive architectural detail on several of Charleston’s Revolutionary-era buildings. The small. circular structure gets its name from Italian “little cup”, and was a popular Venetian ornamentation made popular in Neo-classical designs based on Andrea Palladio’s Four Books of Architecture. The cupola is designed for a dual purpose – to give a building beauty and to help ventilate the structure. The crowning little cup adds a delicate dimension to the architecture, and by opening cupola windows, warm air is released from within. Here in Charleston, the combination of looking good and keeping cool was always a major influence on architecture, and cupolas began to appear shortly before the Revolution in buildings such as the Old Exchange, the Josiah Smith house, and the John Ashe house. The cupola at the Ashe house once overlooked docks along South Bay, now South Battery and Murray Boulevard, and legend says that a light was used as navigation for ships. The horse has been a common sight on the streets of Charleston since its colonial beginnings. Carriages, sulkies and trolleys were common conveyances for people throughout the city’s history, and there were also an assortment of ice wagons, garbage carts, cotton drays pulled by both horse and mule for centuries. In fact, there were livery stables throughout the old city at the turn of the 20th century, and numerous buildings found on Queen, Tradd, Church and Chalmers streets today stand were liveries were in business a century ago. With the combination of wealth, ample land and idle time, many early Charlestonians got hooked on horse racing, and the first regularly-scheduled races were held at the New Market Race Course in the city neck. The area that is now roughly bounded by Blake, King, Huger streets and Morrison Drive offered thoroughbred racing for the first time in February of 1760, and proved so popular that, within the decade, race grounds were created in Jacksonborough, Beaufort and Srawberry. Horse breeding became a major business with stock from around the world, primarily Arabian mixes from England, and highly-advertised races brought immense bets between local planters and equestrians from overseas and other colonies. Some contests were sprints distancing four miles, with wagers well over 2,000 pound sterling. The Revolution proved the value of South Carolina stock, as Francis Marion, William Washington and other mounted patriots overcame tremendous odds on fast, powerful horses. After the war, the Washington Race Course opened at what is today Hampton Park, and had a long, heralded tradition of racing that only died out with the destruction and stealth of horses during and after the War Between the States.